This week Phelps would like to highlight the value of collaboration between community organization. Phelps has developed many wonderful partnerships over the last 5 years; all playing an important role in helping Phelps to offer diverse services that truly meet the needs and interests of the Stanstead area community. Last Saturday, as part of Family Literacy Week, Phelps teamed up with Literacy in Action to hold a family literacy event in Stanstead. Literacy in Action, is a volunteer-based non-profit organization which offers free learning opportunities aimed at improving the essential skills people need for work, learning and life. We were also pleased to have Imagine Stanstead, a local project devoted to adult learning taking part as well. 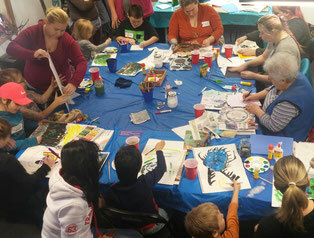 With over 25 participants, ranging in age from 3 – 92 years old, the Arts & Scraps Literacy Event was a true success. Thank you to all the families who participated, and to the partners who helped bring a fun learning activity to our community!